Making your own artwork doesn’t have to time consuming or complicated. 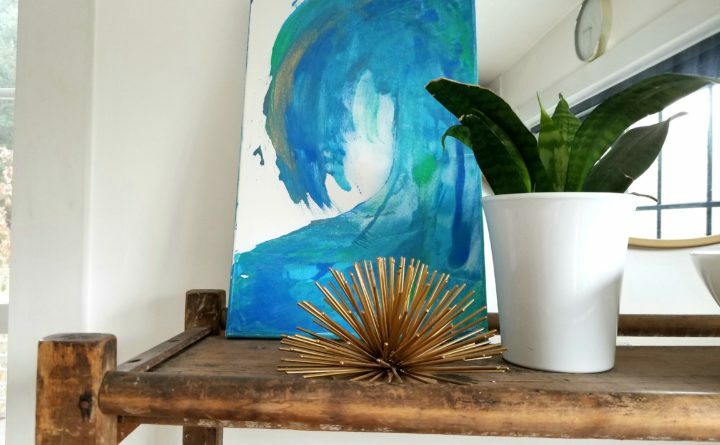 Abstract wave painting is an easy technique that only requires a few supplies and about 20 minutes of work. And fear not! There is literally no way to mess up your work of art with a beautiful marbled effect. Don’t limit yourself to a wave design either. Try a circle, stripes, or cover the entire canvas, then stand back and marvel at your masterpiece. Paint in colors of your choice (if you don’t have all the colors you want, mixing white or ivory into a color you already have can make a lighter shade). Make sure you use a drop cloth for this project. It not only protects the underlying surface, but catches excess paint too. This technique works by putting more paint on your canvas than you actually need so it can spread nicely. The paint will drip off the sides (don’t worry, there is an easy solution to clean that up), and you will want to wipe off your straight edge when you go back over your painting to touch it up. Squirt small blobs of paint on your canvas all the way across the bottom, up one side, and a few going back down, then give them a few squirts of water. This helps the paints run into each other to create a nice marbled effect. Starting at the left-hand side, drag your straight edge across the bottom, up the side, then back down following your paint dots creating a wave. You might need to go over it again with your straight edge to fill in any empty spots or get the shape you want. Be sure to wipe the straight edge off before going over it a second time though. If too many paint colors meld together, you’ll lose the marbled look. Give it a few more squirts of water and let the colors run into each other a bit more. To clean up the paint drips from the sides, take a paper towel and rub the frame of your picture. It gives it a nice finished look while wiping the drips away. Remember, it’s just paint. You really can’t mess it up. It you aren’t happy, just let it dry and start over. This story was originally published in Bangor Metro. To subscribe to the magazine, click here.